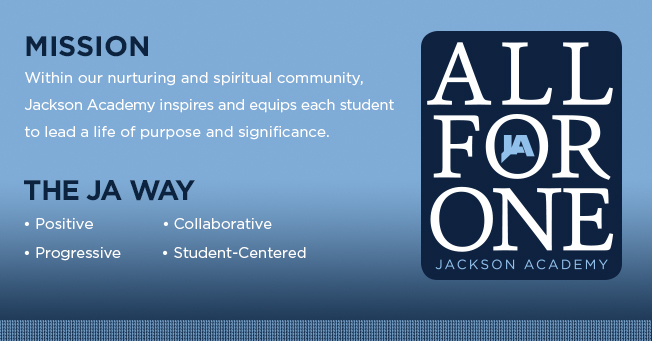 On January 15th, we announced Jackson Academy’s new mission statement to our school community. While I had the honor of presenting it, the new mission statement was developed collaboratively through a yearlong process by twenty members of the Mission Statement Task Force. At the same event, Lisa Jordan with the firm Mindpower revealed our school’s new branding identity. Some have asked, “Why is this important?” Personalizing the question, some may ask, “What does it mean for me? For my children? For my role as a faculty member, a staff member?” One of the things we heard leading up to the announcement was that many people did not know our previous mission statement. In fact, our two student members of the Mission Statement Task Force informed the task force in the very first meeting that they did not know our mission statement or that the school even had a mission statement. Though the previous mission statement was prominently placed in the Parent/Student Handbook and displayed in the halls of our classroom buildings, the mission statement was not part of our regular conversations and everyday discourse. Our new mission statement along with the All for One branding identity gives our school community a common language. There is tremendous, perhaps immeasurable, power in having a common language in any organization, but this is especially true in a mission-driven school. Common language aligns our work and unites our efforts. The strongest characteristic that makes an independent school like Jackson Academy independent is that it is mission driven. In fact, our ultimate and only real measurement as a school is how well we are doing in fulfilling our mission. This is why the National Association of Independent Schools and Southern Association of Independent Schools implore their member schools every year to not provide test scores and other objective but non mission-critical measures of supposed proxies of school success to news media and ranking organizations. Despite this admonition, some independent schools promote comparison of schools based largely on test scores, but to do so significantly lowers the value of what it means to be an independent school. One independent school cannot be ranked against another in any meaningful way. We can only be measured against how well we are fulfilling our unique mission. With that reality explained, it is easy to see the paramount importance of our mission statement. both a promise and an aspiration. In addition to the mission statement, the JA Way further explains our educational philosophy as a school. While the mission statement primarily answers the question of why we exist, the JA Way—- positive, collaborative, progressive, and student-centered—- explains how we go about fulfilling our mission. With clear and concise language of both the “why” (mission statement) and the “how” (JA Way) articulated, we are able to provide incredible clarity of purpose and expectations to our students, faculty, staff, parents, and alumni. We are doing work internally to reinforce clarity in how we communicate and how our many administrative and faculty leadership teams work together. We will also use our human systems such as professional growth and evaluation and hiring practices to reinforce the clarity created by our common language. Our mission statement and brand identity convey both a promise and an aspiration. While every word written is true of JA today, we can always live out the ideals with greater fidelity. For example, Jackson Academy most certainly has a very nurturing community. Of course, that does not mean that every action by every person all of the time will be nurturing. But with a common language that puts the promise to be nurturing at the forefront, behaviors that are inconsistent with nurturing will be glaring in their incongruence. As increased clarity leads to tighter alignment around our mission and the JA Way, we will collectively become increasingly intolerant1 of behaviors that are inconsistent with our shared ideals. Another example is illustrated by a recent discussion a group of teacher leaders had evaluating an element of the curriculum. They discussed the curriculum element in light of the mission statement and concluded that while it did “equip” our students, it did not “inspire” them. On that basis, they decided to discard the old curriculum element and develop a new one. That is an example of the power of having a common language and how it will align and unite our work as a school. What we have articulated about our school are matters of the heart that touch deeply into the very special, unique way Jackson Academy nurtures, inspires, and equips children—- a way that only Jackson Academy can do. We should all be incredibly proud to be a part of a school that can make the bold but true claims that we have articulated in our mission statement and branding identity. In fact, I was so overcome with gratitude to be a part of such a school, I became emotional each time I heard the branding identity presented. I am not alone in this emotional response as I spoke with several others after the announcement who also had tears in their eyes. What we have articulated about our school are matters of the heart that touch deeply into the very special, unique way Jackson Academy nurtures, inspires, and equips children – a way that only Jackson Academy can do. We invite and expect to be held accountable to these promises and high ideals. All for One. Easy to say, harder to do.